The first day of student teaching is a big event for teachers in training. For most student teachers, it’ll be the first time they’re in charge of a classroom, acting as a “full” teacher. This initial day also marks the beginning of an important relationship. This is the teacher trainee’s relationship with his or her school, students, and students’ parents. So making a good impression on your new school is very important on the first day. Coming in strong can set the tone for your entire student teaching experience. A good first impression is a major factor in your long-term success. So let’s look at some things you can do to prepare for your milestone first day in charge of the classroom. 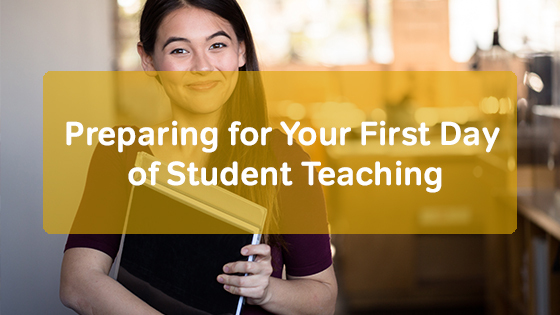 You can prepare for your first day of student teaching months or even years before it happens. This is because all of your teacher training leads up to your student teaching experience. Your textbooks and classes give you the principles you need for classroom success during student teaching and beyond. Really think about how these principles will look in your classroom. And apply that knowledge—get into the classroom before you actually start student teaching. Your school will help you get some early in-classroom experiences. In fact, classroom observations and volunteer work as a classroom aide are usually required as part of a teaching degree. But don’t stop there. See if you can get in some extra volunteer opportunities. And see if you can get some actual paid classroom experience. Summer camps and organizations like the YMCA love to hire education majors to teach classes and work with children. Some states also don’t require a bachelor’s degree for classroom assistants or substitute teachers. These kinds of jobs—if you can find them—are an excellent way to practice for student teaching. Early on in your major, you should also start talking to advisers and professors about what student teaching is like. Learn some lessons about student teaching from those who have gone before you. You can also find out which area schools might be potential student teaching locations for you later in your studies. In most cases, you can let your teacher prep program choose your school for you. Often, they arrange a student teaching experience with a school on your behalf. But you usually also have the option to pick a school. As you do fieldwork and school visitation, treat the schools you encounter as prospects. In most cases, a school you visit is a school at which you could student teach. When the time comes to secure an actual student teaching position, start talking to schools that you’re familiar with. And consider reaching out to schools that you aren’t familiar with yet. Often, seeing how receptive a school is to letting you student teach can help you decide whether the school is actually a good fit for you. Once you’ve chosen a school and secured a student teaching position, start talking to school staff. Let them know you’ll be joining them as a student teacher. Ask them about their school, their students and their community. Ask for advice on how you should approach your teaching work. Find out about any dress codes you should follow. Finally, you could ask about how you could be a “good fit” for the school once you arrive. Schools are very receptive to this kind of advance intelligence gathering! They love working with a teacher trainee who is genuinely interested in them and wants to be a good team player. You need to make lesson plans for your classes on your first day of student teaching–and every day thereafter. That much is obvious. But in your rush to start off on the right foot, don’t forget the importance of contingency plans! These are backup courses of action you can take if the lesson you intend to teach starts to fall flat. You are teaching a group of students for the first time. So there’s always a risk that your lesson will be too easy for them, too difficult, too long, or too short. Be sure you have a few extra plans up your sleeve! Prepare alternate activities if you suddenly find that the things you’d planned just won’t work out. With advance preparation and these kinds of contingency plans, your first day is likely to go pretty well, come what may. But on rare occasions, every contingency plan fails. When that happens, a whole day of teaching can go off the rails. In case this kind of teaching disaster hits on your first day, be sure to also bring the ultimate contingency plan: failing with dignity and humor. If you’ve already made the effort to build rapport with your school, a bad day of teaching doesn’t have to make a bad first impression. And it might not even amount to a truly bad first day of your student teaching adventure.